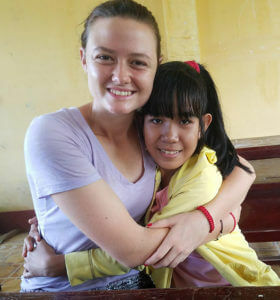 Hannah Petersen, a junior Finance and Risk Management major, tutors a child in southern Vietnam. Hannah Petersen heard stories of how difficult it would be to say goodbye to her new friends in Vietnam after a three-week stay of service in Summer 2017. Petersen, a Finance and Risk Management major on the St. Mary’s Women’s Tennis team, was in Vietnam in July and August volunteering for a service-learning program called Coach for College. 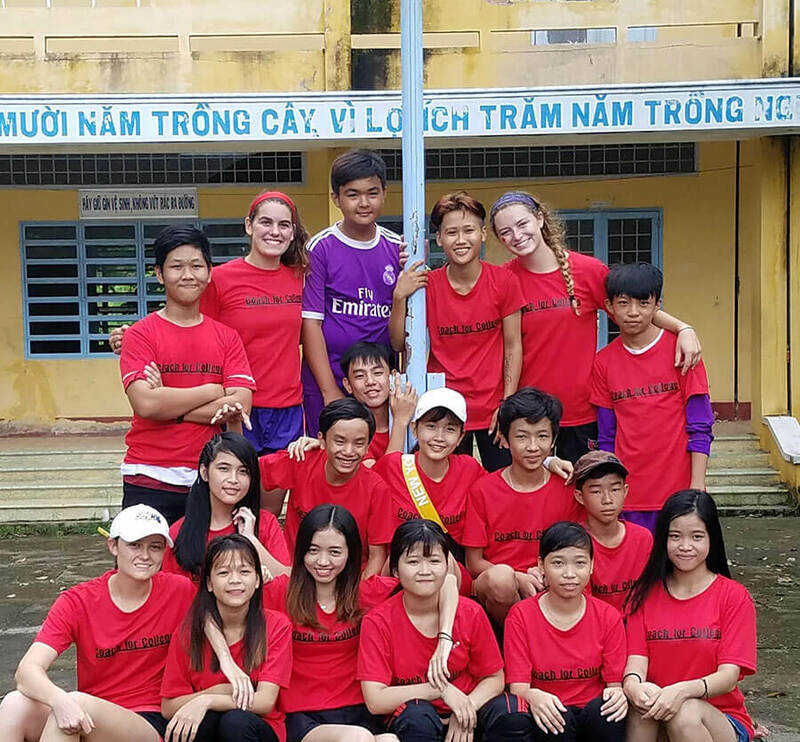 The program pairs American student-athletes and Vietnamese university students to teach academics, sports and life skills to disadvantaged children in rural Vietnam. The junior is the definition of student-athlete. A standout in class and on the court, she reached the Intercollegiate Tennis Association’s South Central Regional Doubles Championships in 2016, receiving ITA Scholar-Athlete and First-Team All-Heartland Conference honors along the way. She also earned all-conference second team recognition in 2017. As her time to leave Vietnam neared, Petersen thought she would escape the grief countless others had felt upon leaving. That was, at least, until her last day arrived. “It hit me really, really hard,” Petersen said. “The kids make the most delicate little gifts for you. A lot of them wrote letters to us. After giving us those gifts, they’re just standing there, sobbing. They’re hugging us and won’t let go, holding on so tight. Petersen formed a close bond with eighth- and ninth-grade students during her three weeks in Vietnam. Petersen, a Greehey Scholar and President’s Ambassador at St. Mary’s, knew she had entered a different world as soon as she landed in the Hậu Giang Province, located in southern Vietnam. Responsible for teaching eighth- and ninth-graders skills such as developing goals and encouraging teamwork, she was struck by the condition of the school and surrounding homes. The nearby homes were in similar disrepair, featuring palm and banana leaves as exterior walls, tin roofs, and hammocks and wooden pallets for beds. One such home, with 5-foot-high metal sheets and curtains stapled together to form walls, was attached to the tennis court where Petersen practiced with the children. No matter the children’s circumstances, smiles abounded, she said. This, more than anything, left an impression. Most of the children knew little English, requiring the Vietnamese university students to translate for Petersen and the other Americans. But even with this language barrier, lifelong bonds formed. 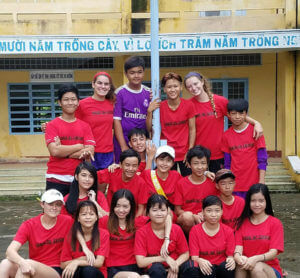 The Coach for College program pairs American student-athletes with Vietnamese university students to teach academics, sports and life skills to children in rural Vietnam. Intending to help others through her time in Vietnam, she said she returned home better off, as well. “It showed me what it means to someone just to give them your time,” Petersen said. “It made me re-prioritize what’s most important. Is it about going through life and having an income? Or is it about impacting people’s lives?